What’s It About? Nils (Stellan Skarsgard) drives a snow plough in the Norwegian mountains, a role which has earned him the ‘Citizen of the Year’ award. When his son is found dead with a lethal amount of drugs in his body, Nils refuses to believe he was involved with drugs. He sets about finding those responsible, igniting a gang war in the process. Verdict: Although it’s described as an action-comedy in marketing materials, this is a label that simply doesn’t do justice to In Order Of Disappearance. Teaming up with director Hans Petter Moland for the third time, Skarsgard is brilliant as the mild-mannered family man who becomes a brutal father out for revenge. Nils is adamant his son has been murdered, whilst his wife accepts the death-by-drugs verdict. This strain breaks them apart, and the film dramatically changes here on in. Whilst this sets up the film in the beginning, his wife is long since forgotten by the time the plot really gets moving, leaving the way open for Skarsgard’s excellent central performance. Starting with his son, each time a character is killed (and many, many are over the course of the 116-minute runtime), we see a title card to mark their passing, complete with their street nickname and religious denomination. Some of these in themselves are funny, because, as well as some particularly gruesome and creative deaths, this is a very funny film with some great lines. Even the snow plough gets involved in the killing. Taking place in the mountains as the film does, snow permeates nearly every scene, meaning we can see why Nils, with his plough, became the man of the year, but it also sets the tone for the movie. A slightly off-beat, funny story taking place in a snowy little town, with plenty of deaths… it’s hard not to think of Fargo, and whilst this isn’t quite as high on the quirk-factor that films from the Coen Brothers have, it’s not an unworthy comparison. It also bears similarities to films like In Bruges, in the blend of comedy and action. As the plot of the film escalates, so the gangster characters take over more of the screen time, and this is a good thing. 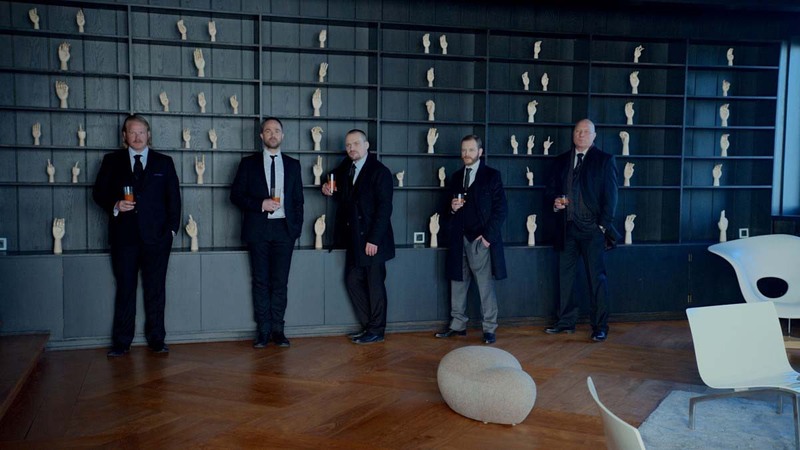 On the one side are the Norwegian gangsters, with boss The Count (Pal Sverre Hagen) being the standout character of the film. Almost a full caricature, he’s a neurotic vegan in the process of divorcing his wife, in a custody battle over their child. He’s completely superficial, with his over-the-top house and silly haircut, coming out with lines such as ‘It’s not always easy being me’. Despite his ridiculousness, he has the respect of his gang throughout his unpredictability; and you do get the feeling he could fly off the handle and kill somebody at any point should he decide he needs to. On the other side are the Serbian mobsters, led by the elderly Papa (Downfall’s Bruno Ganz). The contrast between the two sides is brilliantly shown, from the decorations in their respective lairs to the way they treat their leaders. There are scenes of the gangsters off-duty on both sides – singing in the car, having snowball fights and trying their hand at paragliding – that are really fun to watch. It ends in a fairly familiar fashion, though the predictability of this can be forgiven for a film that is about the entertaining journey it takes, through the snow, rather than the destination. It’s a difficult task for a film to balance action, comedy and emotion, but this is a film that just gets it right. Final Words: Though seemingly beginning as a straight-up revenge drama, this quickly turns into something quite different, and is all the better for it. 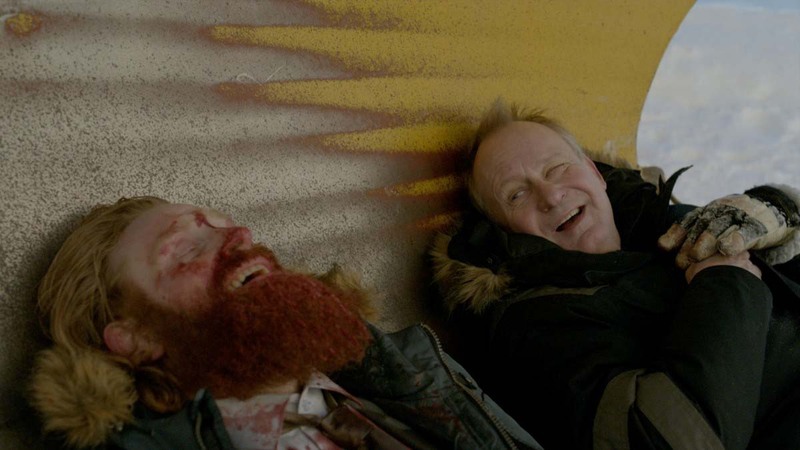 It is a mix of comedy and action that few films can pull off, and much of that is down to the direction of Moland, the understated central performance of Skarsgard, and the funny and well-written script. It’s a real treat, and well worth checking out. In Order of Disappearance (Kraftidioten) is out in UK cinemas on 12 September 2014.